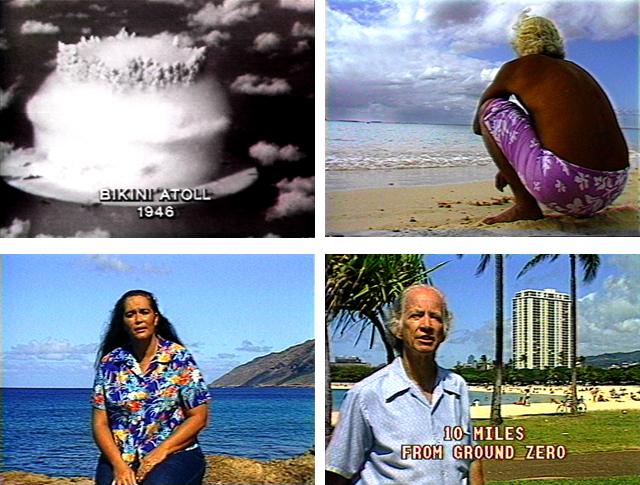 Produced for , this program explores, in stark and sobering detail, the medical and social effects of a theoretical nuclear attack on Hawai‘i. Hosted by Ho‘oipo Mable DeCambra. 4:38: Twenty megatons is the equivalent of 20 million tons of TNT - would require a freight train 200 miles long or 40,000 shipping containers to carry it. 4:50: Twenty megatons is the equivalent of all of the explosives unleashed in all four years of World War II ... the same as 1400-1500 Hiroshima-sized bombs. 12:14: We may live on an island far away from other continents, but we share one thing in common with all of humanity, and that is the threat of complete annhilation. It can come swiftly, so we must act swiftly. Every moment is the right moment to begin. Every person is the right person to act. Do not fear being labeled a radical. After a nuclear exchange, there are no radicals or conservatives. There are no Democrats or Republicans, no capitalists or socialists. Just dead people. And a few survivors who wish they were dead. If you were on a speeding bus headed toward the cliff, wouldn't you want to tell the driver to put on the brakes? 20:32: The possibility is very strong that thirty years after this horrible event, fully half the people remaining would be dying each year of cancer- and of particularly difficult types to treat. 24:48: Here we are at Lua Lua Le on the Hawaiian coast. ... Lua Lua Le is a major communications center for nuclear armed forces. Real people work here. Real people live all around here. It's people who vote for candidates. People who pay tax money for government programs. And it's people who push the buttons that start wars. Real people like you and me must prevent a nuclear catastrophe. We mustn't stand by while others tell us whether the world will survive. We must take responsibilty and preserve this 'Aina (land) and the life that goes with it. Would you recommend Puhipau - PSR- Hawai'i on impact of a nuclear blast in Hawai'i to a friend? Your Review on Puhipau - PSR- Hawai'i on impact of a nuclear blast in Hawai'i has been successfully submitted.